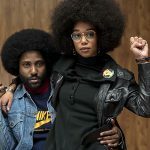 Joyce Glasser reviews BlacKkKlansman (August 24, 2018) Cert. 15, 135 min. In Spike Lee’s triumphant, satirical, angry, righteous new film, BlackkKlansman , we watch a group of fired-up Ku Klux Klan (KKK) members cheer on the heroically- portrayed Clansmen of D.W. Griffith’s film Birth of a Nation as they slaughter rebellious black slaves, portrayed as the subhuman rapists of white women. This scene is intercut with a fictitious civil rights leader (Harry Belafonte) reminding his black student audience that President Woodrow Wilson declared that the 3-hour 1915 film was, ‘like writing history with lightning.’ Now Spike Lee, who highlighted the barbarism of the KKK before in his short film The Answer and in his superb documentary Four Little Girls, writes his own bit of history with thunder and lightning, turning Ron Stallworth’s 1914 autobiography into a call to arms. The irony of Stallworth’s memoir is so potent that you couldn’t make it up. In 1972 Ron Stallworth’s family moved from El Paso, Texas to Colorado Springs, Colorado where Ron pursued his interest in law enforcement. His goal was to do undercover work. In the film we see him attend a job interview at the all-white Colorado Springs Police Department where he is asked questions that are clearly racist, but are not all that different from the questions older candidates are asked. Instead of, ‘how would you feel taking orders from a young manager?’ Ron is asked if he could restrain himself if addressed disrespectfully. Ron is assigned to the records room where he is bored stiff and subjected to mild racism by one of the cops, but is generally accepted. His chief, Robert John Burke, eventually gives in to Ron’s pleas and sends him undercover. As in real life, his first assignment is to observe the reaction of black students when Kwame Ture (Corey Hawkins) AKA Stokely Carmichael, known to be an effective orator, addresses the Black Student Union of the University of Colorado. Ron finds himself getting swept up in the rhetoric (Ture’s message, if not his fiery tone, is reminiscent of James Baldwin’s) and feels somewhat conflicted in his work, particularly when he approaches Patrice (Laura Harrier), the intelligent, pretty, but wary President of the Union. Patrice’s reference to police as ‘pigs,’ for starters, would make any long-term, serious romance problematic. 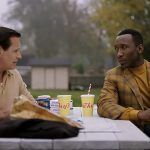 During their conversations, and before he confesses, Ron tries convincing Patrice that working within the system to change it is only possible with black law enforcement agents. In 1979 (time is compressed in the film), Ron notices a wanted ad in the local paper seeking members to start a new chapter of the Ku Klux Klan in Colorado Springs. Ron is struck at the brazenness of the advertisement, and on a whim, decides to respond. He phones and poses as a white man who hates blacks, Jews, Mexicans and Asians. Ron is so overwhelmed by the success of his subterfuge when a meeting is arranged, that he gives his real name. 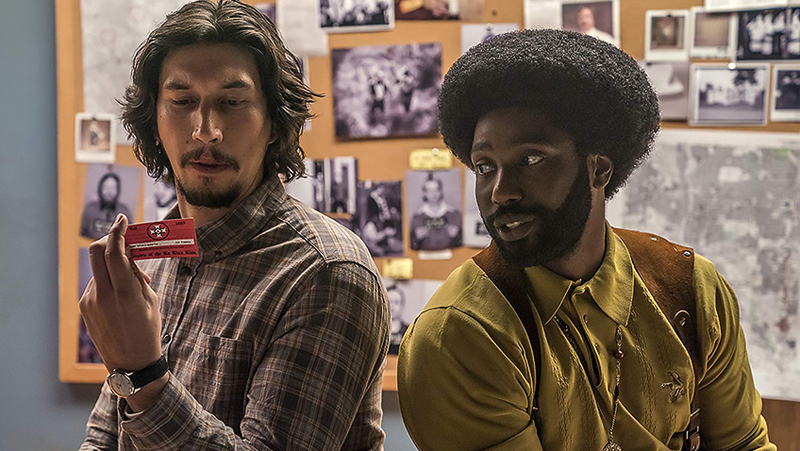 He then has to convince his superiors and his colleague Flip Zimmerman (Adam Driver), a white undercover narcotics officer, to become Ron Stallworth and stand in for him at the meeting. In real life Driver’s character was not Jewish, and in the film he is a non-practising Jew who has never really thought about his religion. This does not really change when one of the clansmen he meets announces that he ‘smells a Jew’ and wants to subject Flip to a lie detector test. The teamwork necessary to protect Flip’s identity and pull off the substitution naturally draws the two men closer together. At times Flip takes over as the lead character, in the film, but we never learn about Flip’s personal life, his feelings about the assignment, his religion or about Ron. 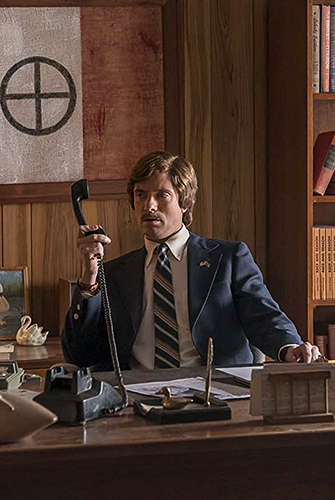 At one point during the investigation Ron, who has applied for membership of the KKK, phones a number he has to follow-up on his card and is astonished to find himself talking to ‘Grand Wizard’ David Duke (a chilling, nicely understated performance from Topher Grace). Duke takes a liking to the sycophantic, racist man on the phone and at one point brags that he can always tell if he is talking to a black man by the way he pronounces the word ‘are.’ This is true, and what is also true is that when Duke visits the new chapter at Colorado Springs (in the film, it coincides with Flip’s inauguration ceremony), Ron is assigned to be his police guard. Lee unleashes the farce inherent in this almost surreal situation, particularly in the (apparently true) scene where Ron brazenly asks for a photo of him and Duke together. Ron beams to the camera aware of Duke’s discomfort which is palpable. Elsewhere the satirical humour gets the better of the drama. The clansmen (and one wife) are portrayed as such bungling, disorganised idiots that the tension is not always as excruciating as it should be and with more hot air than deeds. It is curious that Ron is not worried about his secret being given away by his racist colleague or that he and Flip can remain at the force without fear of reprisal after the successful operation is closed down. Four writers (Charlie Wachtel, David Rabinowitz, Kevin Willmott and Spike Lee) are credited with the adaptation and that might be responsible for the uneven nature of the script. 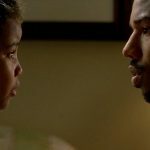 Lee has made films about race relations before, most notably in his great, early film, Do the Right Thing and in his commanding autobiographical Malcolm X (whose father was murdered by a KKK splinter group), starring Denzel Washington. 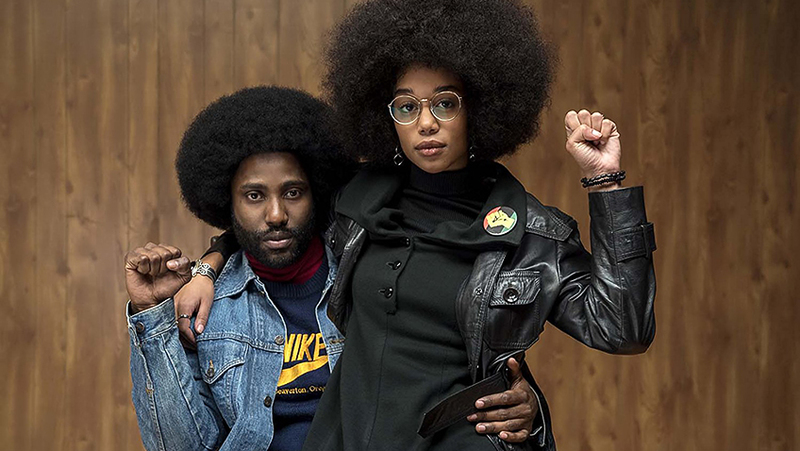 In BlackkKlansman Lee combines a police investigation into the KKK with a civil rights film by running a double story about the burgeoning civil rights activity of University of Colorado and casts Denzel’s son (John David Washington) as the black police officer who believes change can happen from within the system. That John David does not quite have his father’s presence and charisma is one of the film’s weaknesses. Lee is a masterful documentary film maker and here he uses fictitious and real documentary footage to bookend the story. The ending is a news clip of last year’s ‘Unite the Right’ white supremacist rally in Charlottesville in which a 32-year-old white protester was murdered. It reminds us, graphically, that the battle goes on, but in terms of the film, the Stallworth story itself drifts off without a satisfactory ending.